Laos, officially the Lao People's Democratic Republic, is a landlocked socialist republic communist state in southeast Asia, bordered by Myanmar (Burma) and the People's Republic of China to the northwest, Vietnam to the east, Cambodia to the south, and Thailand to the west. Laos traces its history to the Kingdom of Lan Xang or Land of a Million Elephants, which existed from the 14th to the 18th century. After a period as a French colony, it gained independence in 1949. A long civil war ended when the communist Pathet Lao came to power in 1975. Private enterprise has increased since the mid-1980s, but development has been hampered by poor communications in the heavily forested and mountainous landscape. 80% of those employed practice subsistence agriculture; this is coupled with widespread starvation due to the many failures of communism and the state's command economy. 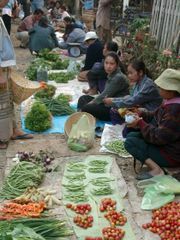 The country's ethnic make-up is extremely diverse, with only around 60% belonging to the largest ethnic group, the Lao. The country's name in the Lao language is 'Muang Lao'. The French, who made the country part of French Indochina in 1893, spelled it with the s which is usually retained in the spelling and pronunciation of the English name (pronounced as one syllable). The usual adjectival form is "Lao" (as in 'the Lao economy'), not 'Laotian', although the latter is commonly used to describe the people of Laos (to avoid confusion with the Lao ethnic group). Laos traces its history to the kingdom of Lan Xang, founded in the 14th century, which lasted until the 18th century, when Siam invaded and assumed control of the separate principalities that remained. To avoid a costly war with the French, the Siamese king ceded lands now known as Laos to them, and these were incorporated into French Indochina in 1893. The French saw Laos as a useful buffer state between the two expanding empires of France and Britain. 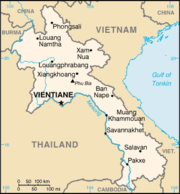 Under the French, the capital (Vieng Chan) was changed to Vientiane. Following a brief Japanese occupation during World War II, the country declared its independence in 1945, but the French re-asserted their control and only in 1950 was Laos granted semi-autonomy as an "associated state" within the French Union. Moreover, the French remained in de facto control until 1954, when Laos gained full independence as a constitutional monarchy. Under a special exemption to the Geneva Convention, a French military training mission continued to support the Royal Laos Army. In 1955, the U.S. Department of Defense created a special Programs Evaluation Office to supplant French support of the Royal Laos Army against the communist Pathet Lao as part of the U.S. containment policy. Political unrest in neighbouring Vietnam dragged Laos into the Second Indochina War (see also Secret War and Vietnam War), a destabilising factor that contributed to civil war and several coups d'état. The North Vietnamese Army invaded and occupied portions of eastern Laos. The North Vietnamese army, with its heavy weapons including heavy artillery and tanks was the real power behind the Pathet Lao insurgency. Significant aerial bombardment by the United States occurred by that country's attempt to eliminate North Vietnamese bases in Laos and disrupt supply lines on the Trường Sơn Trail (known to Americans as the Hồ Chí Minh Trail). In 1968 the North Vietnamese Army launched a multi-division attack against the Royal Lao Army. The attack resulted in the army largely demobilizing and leaving the conflict to irregular forces raised by the United States and Thailand. In 1975 the communist Pathet Lao, backed by the Soviet Union and the North Vietnamese Army (justified by the Communist ideology of "proletarian internationalism"), overthrew the royalist government, forcing King Savang Vatthana to abdicate on December 2, 1975 (he later died in captivity). After taking control of the country, they renamed it the Lao People's Democratic Republic. The Pathet Lao government afterward signed agreements giving Vietnam the right to station military forces and to appoint advisors to assist in overseeing the country. Laos was ordered in the late 1970s by Vietnam to end relations with the People's Republic of China which cut the country off from trade with any country but Vietnam . Control by Vietnam and socialisation were slowly replaced by a relaxation of economic restrictions in the 1980s and admission into ASEAN in 1997. Vietnam still wields political and economic influence in Laos. The 20-year embargo by the United States was lifted in 1995. The United States established Normal Trade Relations (previously known as Most Favored Nation status) with Laos in November 2004. The only legal political party is the Lao People's Revolutionary Party (LPRP). The head of state is the President, elected by parliament for a 5 year term. The head of government is the prime minister, appointed by the president with parliamentary approval. Government policies are determined by the party through the all-powerful nine-member Politburo and the 49-member Central Committee. Important government decisions are vetted by the Council of Ministers. Laos adopted a new constitution in 1991. The following year, elections were held for a new 85-seat National Assembly with members elected by secret ballot to 5-year terms. This unicameral parliament, expanded in the 1997 elections to 99 members, approves all new laws, although the executive branch retains authority to issue binding decrees. The most recent elections took place on 30th April 2006 when 175 candidates in 16 electoral areas competed for 115 seats. Remnants of a Hmong group allied with the United States during the Vietnam War have been in armed conflict with the communist regime since 1975. With recent surrenders reported in the international media, this conflict appears to be on the wane. Most Hmong are integrated into or at least at peace with society, with some occupying high-ranking positions in the state system. Attacks continue to take place sporadically throughout the country, but are difficult to attribute to a specific political movement. All dissent in Laos is suppressed, so information is difficult to obtain. 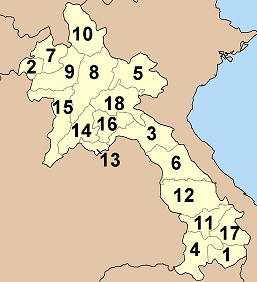 Laos is further subdivided into districts (muang). Laos is a landlocked country in Southeast Asia and the thickly forested landscape consists mostly of rugged mountains, the highest of which is Phou Bia at 9,242 feet (2,817 m), with some plains and plateaus. The Mekong River forms a large part of the western boundary with Thailand, whereas the mountains of the Annamite Chain form most of the eastern border with Vietnam. The climate is tropical and characterised by monsoons. There is a distinct rainy season from May to November, followed by a dry season from December to April. The capital and largest city of Laos is Vientiane, and other major cities include Luang Prabang, Savannakhet and Pakse. The government of Laos - one of the few remaining official socialist states - began decentralising control and encouraging private enterprise in 1986. The results, starting from an extremely low base, were striking - growth averaged 6% in 1988- 2004 except during the short-lived drop caused by the Asian financial crisis beginning in 1997. As in many developing countries, the major urban centers have experienced the most growth. The economies of Vientiane, Luang Prabang and Savannakhet in particular have experienced significant booms in recent years. Laos' economy is heavily dependent on investment and trade with its larger and richer cousin, Thailand. Pakxe has also experienced growth. Much of the country, however, lacks adequate infrastructure. Laos has no railways, although a short link is planned to connect Vientiane with Thailand over the Thai-Lao Friendship Bridge. The major roads connecting the major urban centres, mainly forming Route 13, have been significantly upgraded in recent years, but villages that are far from major roads are accessible only through unpaved roads that may not be accessible year-round. There is limited external and internal telecommunication, particularly of the wire line sort, but mobile cellular phone usage has become widespread in urban centres. In many rural areas electricity is either not available or offered only during scheduled periods. The rivers are very important for transportation: A ferryboat on the Nam Ou river. Subsistence agriculture still accounts for half of GDP and provides 80% of total employment. Laos has the lowest percentage of arable land and permanent crop land in the Greater Mekong Subregion . Only 4.01% of Laos is arable land, and only 0.34% of the country is planted with permanent crops . Rice dominates agriculture, with about 80% of the arable land area used for rice production . Approximately 77% of Lao farm households are self-sufficient in rice. Through the development, release and widespread adoption of improved rice varieties; and through economic reforms, Lao PDR achieved a net balance of rice imports and exports for the first time in 1999 . Between 1990 and 2005, rice production increased from 1.5 million tons to 2.5 million tons — an average annual growth rate of more than 5% . This increase in production has been valued at $8 million to $19 million per year. Lao PDR has the greatest number of rice varieties in the Greater Mekong Subregion. Since 1995 the Lao government has been working with the International Rice Research Institute (IRRI) to collect seed samples of each of the thousands of rice varieties found in Laos . The economy receives aid from the IMF and other international sources and from new foreign investment in food-processing and mining, most notably of copper and gold. Tourism is the fastest growing industry in the country. However, economic development in general is hampered by a serious case of brain drain. A 2005 World Bank study reported that 37% of educated Laotians lived abroad, putting the country in 5th place for worst brain drain. 60% of the country's people are ethnic Lao, the principal lowland inhabitants and the politically and culturally dominant group. The Lao belong to the Tai linguistic group who began migrating southward from China in the first millennium AD. A further 8% belong to other "lowland" groups, which together with the Lao people make up the Lao Loum. Hill people and minority cultures of Laos such as the Lua (Lua), Hmong (Miao), Yao (Mien), Black Thai, Dao, Shan, and several Tibeto-Burman speaking peoples have lived in isolated regions of Laos for many years. Mountain tribes of mixed ethno/cultural-linguistic heritage are found in northern Laos. Collectively, they are known as Lao Soung or highland Laotians. In the central and southern mountains, Mon- Khmer tribes, known as Lao Theung or mid-slope Laotians, predominate. Some Vietnamese and Chinese minorities remain, particularly in the towns, but many left in two waves; after independence in the late 1940s and again after 1975. The term Laotian does not necessarily refer to the ethnic Lao language, ethnic Lao people, language or customs, but is a political term that also includes the non-ethnic Lao groups within Laos and identifies them as "Laotian" because of their political citizenship. In a similar vein the word "Lao" can also describe the people, cuisine, language and culture of the people of Northeast Thailand (Isan), Northern Thailand ( Chiangmai) and ( Chiangrai) who are ethnic Lao. The predominant religion is Theravada Buddhism which, along with the common Animism practiced among the mountain tribes, coexists peacefully with spirit worship. There also are a small number of Christians, mostly restricted to the Vientiane area, and Muslims, mostly restricted to the Myanmar border region. Christian missionary work is regulated by the government. The official and dominant language is Lao, a tonal language of the Tai linguistic group. Midslope and highland Lao speak an assortment of tribal languages. French, once common in government and commerce, has declined in usage, while knowledge of English, the language of the Association of Southeast Asian Nations (ASEAN), has increased in recent years. Theravada Buddhism is a dominant influence in Lao culture. It is reflected throughout the country from language to the temple and in art, literature, performing arts, etc. Many elements of Lao culture predate Buddhism, however. For example, Laotian music is dominated by its national instrument, the khaen, a type of bamboo pipe that has prehistoric origins. The khaen traditionally accompanied the singer in lam, the dominant style of folk music; there are several different styles of lam, some, such as lam saravane, being more popular than others. The country has two World Heritage sites — Luang Prabang and Wat Phou — while the government is seeking the same status for the Plain of Jars. The People's Republic of China has recently allowed its citizens to travel more freely to Laos. As such, Chinese tourists are expected to account for 25% of the total number of visitors to Laos (up from only a few percent) in 2006. Pressures to modernize tourist infrastructure, particularly to cater to package tourism, are expected to significantly impact Luang Prabang and other culturally important Laotian cities. Rice is the staple food and has cultural and religious significance. There are many traditions and rituals associated with rice production in different environments, and among many ethnic groups. For example, Khamu farmers in Luang Prabang plant the rice variety Khao Kam in small quantities near the hut in memory of dead parents, or at the edge of the rice field to indicate that parents are still alive.